Antarctica is an immense virtually untouched continent where nature reigns as queen. Owned by no one but its few wild inhabitants that managed to adapt to the glacial climate, Antarctica is a place of singular beauty. This 11-day Antarctica cruise takes you in the heart of this remote continent, where the evening sun paints the snowcaps incredible shades of rose and orange, where green moss vibrates against rusty red lichens on the rocks, and where in the slanted light, icebergs look like gems: turquoise, violet, deep river blue. The stunning astronomical phenomenon known as the Aurora Australis, or the Southern Lights, sometimes shimmer and light up the night sky making for unforgettable vistas. In November and December, summer in the southern hemisphere, the sun beats down on the countless glaciers, and the snowmelt feeds the crystalline lakes. From December to January, penguin chicks hatch and the continent comes alive with the fuzzy birds taking their first steps. When the engines of the cruise ship are turned off, the only sounds are of passing birds or the occasional boom of icebergs calving. Upon arrival at the Ushuaia airport you will be met by one of our representatives who will take you to your confirmed Ushuaia hotel. You’ll have the remainder of the day to start exploring Ushuaia, the city at the “end of the world,” and rest at your hotel before starting your exciting Antarctica cruise the next day. Enjoy a filling breakfast at your hotel before meeting your guide for an exciting tour of the magnificent Tierra del Fuego National Park where you’ll be able to hike some of the many trails. After the tour, you’ll be treated to a traditional Argentine meal of asado barbecue consisting of lamb, beef and chicken cooked over an open fire. You will then be taken to the dock to board your comfortable Antarctica cruise ship. You’ll begin the cruise sailing across the stunning Beagle Channel. You’ll enjoy your first evening and night aboard your cruise ship as you sail away from the Argentinean coast. Wake up aboard your ship and enjoy a day learning about these fascinating lands with the expert ornithologists, marine biologists, historians, and geologists that accompany you on the cruise. There will be various informative presentations on board to prepare you for what you’ll see during your shore excursions. You will cross the famous Drake Passage on the way. This 500-mile wide passage separates the northern tip of the Antarctic continent from the bottom part of South America. After two days at sea, you’ll reach the superb Antarctic Peninsula and South Shetland Islands where you’ll have the opportunity to ride zodiacs to the shores and set off on exciting land excursions. Depending on the weather conditions which are ever changing in this remote area of the world, you’ll enjoy various activities in the striking Antarctic Peninsula. You will have the chance to explore stunning pebbled beaches teeming with colonies of penguins, plunge in the polar, icy waters of Paradise Bay, kayak among gigantic whales and barking fur seals, mountaineer on icy inclines, or cruise across awe-inspiring glaciers. Many factors influence your ship and expedition’s progress, so your program is subject to change depending on weather and sea conditions. In general, three landings are scheduled each day to allow you to explore the treasures of the Antarctic continent. Once you’ve had your fill of the many wonders offered by Antarctica, you will depart on the journey back to Argentina, crossing the Drake Passage again. You will enjoy many educational and fun-filled activities with your expert guides aboard the ship as you make your way back to civilization. Your thrilling Antarctica cruise ends today as you reach the port of Ushuaia, where you’ll say final goodbyes to the crew and your fellow travelers before disembarking the ship. Meet your transfer to the airport for your journey home or on to your next exciting destination. If you wish to keep exploring the beautiful Patagonia region, check out our additional Ushuaia tours or browse our full range of Argentina travel destinations for ideas to continue your Argentina vacation. Prices vary depending on date of travel and selected cruise ship. Contact your travel advisor for more information. Built to face the rough and icy waters of the Antarctic, the stylish Scandinavian-designed Ocean Nova boasts 38 comfortable cabins equipped with all modern amenities to make your cruise to the Antarctica as enjoyable as possible. It’s ice-stengthened hull allows the Ocean Nova to sail and park in some of the most remote and unattainable locations, providing ample opportunities for on shore explorations. The boat features a spacious dining area, glass-enclosed observation and presentation lounges ideal to admire the breathtaking landscapes from aboard, an exercise room and fully-stocked library. The elegant Clipper Adventurer is an adventure ship which has been operating in Antarctica since 1975, and underwent massive renovations in 1998. One of the most comfortable cruise ships sailing the Antarctic continent, this 101 meter-long boat feature 61 well appointed cabins all boastings outside views and modern amenities. Among the amazing facilities aboard are a presentation room, 2 lounge bars, a library, gift shop, exercise room and massage therapist. With twin, triple, superior, deluxe and suite cabins, the Clipper Adventurer is able to accommodate the needs and preferences of all travelers. This two hour Ushuaia city tour explores the depths of Ushuaia’s history, taking you to the historic center of town, the lively port, and through the hilly streets for excellent views of city and its beautiful surroundings. The tour ends at the Museum of the End of the World, where you will learn about the city’s history, which includes an exciting mix of pirate, adventurer, and Indian legends. You can also visit the prison to learn about the convicts who once rode the Convict Train into Ushuaia, as well as visit the Maritime Museum. Your guide will meet you at your hotel and you will start your tour navigating the Beagle Channel, sailing across the Ushuaia Bay and the northern coast of the channel, passing by the famous “Les Eclaireurs” lighthouse. On the way, you will be able to observe many colonies of nesting seabirds on the islands and cliffs. You will then continue on, passing the estancias Punta Segunda and Remolino, and approaching the Monte Sarmiento, a ship abandoned since 1911. You will continue sailing up the coast of the mysterious Gable Island with its green rolling hills where condors nest. 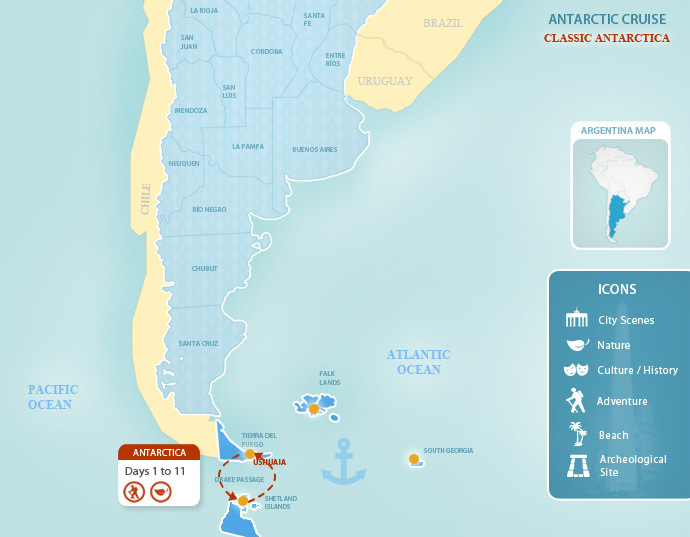 You will then reach Martillo Island where a colony of Magellanic penguins settles every year. After spending some time observing the penguins, you will continue toward Haberton Bay and dock at the Estancia Haberton, where you will enjoy a guided tour of the carpentry, shearing shed, cemetery, nature reserve, and the beautiful gardens. After your visit, you will have some time to rest, enjoying tea and homemade pastries before sailing back to Ushuaia where you will be taken back to your hotel. This full day tour of Fagnano and Escondido Lakes takes you in a 4x4 vehicle from Ushuaia to the beautiful, rugged landscape of the bottom of the world. From Ushuaia, you’ll take National Route 3 about 37 miles (60 km) north, where you’ll be able to enjoy the landscape of the Carabajal and Tierra Mayor Valleys. At Tierra Mayor you will have free time to try snow-shoe hiking, Nordic skiing, dog sledding, or simply enjoy the views from the toasty warm hostel. A Fueguian lamb barbeque (included) will be served. You’ll continue up to Paso Garibaldi, a panoramic spot with an impressive view of the Escondido and Fagnano Lakes. You’ll then arrive at the shores of Fagnano Lake from where the tour will continue off road along the coast for about 6 miles (10 km). After skirting the Bombilla Lagoon, the vehicle goes back into the woods following a secondary road that eventually rejoins Route 3, and heads back to Ushuaia.